We have three ways to measure the power emitted by a glass taper. For all methods, we mask the LED with black tape and we use our SD445 photodiode. The photodiode measures 10 mm × 10 mm. 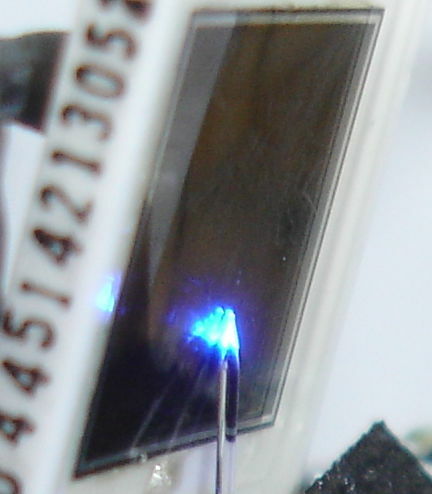 With no reverse bias, this photodiode has sensitivity 0.18 mA/mW at 460 nm (see LED Efficiency). In the first method, we measure the light intensity emitted in an array of directions and integrate over a hemisphere to obtain total emitted power. In the second method, we place our photodiode in five locations to make a virtual cube of photodiode 10 mm on each side, centered on the taper. We add the photocurrents together and so obtain an estimate of total power. In the third method, we hold the photodiode as shown below. Figure: Single-Location Measurement of Taper Power Output. The transparent plastic surface of the photodiode reflects light with angle of incidence greater than 80°. The above arrangement results in the photodiode receiving light emitted by the taper within a ±80° wedge in the horizontal plane. To obtain total power emitted, we multiply the photocurrent by 360°/160° = 9/4 and divide by the sensitivity 0.18 mA/mW. Of our three methods, the first is the most time-consuming and prone to error. The second is prone to error due to incorrect placement of the photodiode. The third is the easiest. We measured the power output of A3024HFB No2.9 with Method Two and obtained 10.8 mW at 30 mA forward current. We applied Method Three and again obtained 10.8 mW. From now on we will use Method Three and assume it is accurate to ±10%. We will refer to Method Three as the angled photodiode method. We use the angled photodiode method to measure total power output versus forward LED current for A3024HFB No2.9, and obtain the following plot. Figure: Taper 2.9 Output Power versus LED Forward Current. We see that the taper emits roughly 11 mW at 30 mA, 18 mW at 50 mA, and 22 mW at 70 mA. When the forward current is above 50 mA, however, the output power drops during the seconds after we apply the current. Thirty seconds after we apply 80 mA, the power has dropped by 10%. 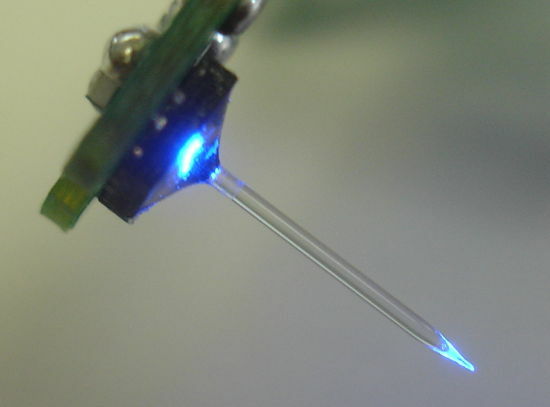 This drop is due to self-heating of the LED.